Anuar Fernandez Olvera is from Mexico. He received his Bachelor Degree in Electronic and Computer Engineering from Monterrey Institute of Technology and Higher Education (ITESM), and his Master Degree in Electrical Engineering from Eindhoven University of Technology (TU/e). 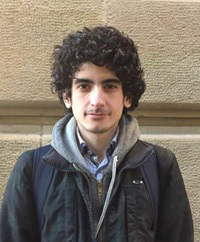 During his master program, he worked on some experimental projects with millimeter waves and on efficient techniques to model electromagnetic phenomena. He ultimately graduated with a thesis entitled: “Hybrid FE-BI Numerical Tool for the Analysis and Design of Plasma Antennas”. The work he did during his master studies made him realize how electromagnetics can be used effectively in both sides of the spectrum (optical and RF) to reduce the so-called THz gap. This led him to join the THz Systems Group of Darmstadt University of Technology (TUD). There, he is working under the supervision of Prof. Sascha Preu on the development of a Photonic Vector Network Analyzer for THz frequencies, using photomixers as sources and detectors.